I have recently began collecting Kelloggs Family Rewards Points, which can be found on the inside of Kellogg's packaging. There are also free books that you can get from Scholastic through Kelloggs and I have taken advantage of those rewards as well. 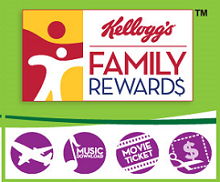 So, if you don't already, you can collect Kelloggs Family Reward Points and start saving for some awesome rewards! Books, coupons and other great rewards can be yours for free. To get NEW FREE Kelloggs Family Rewards Points Code – login or register to enter codes listed below. With your points you can get some fantastic rewards here. As soon as more codes become available we will be sure to post more updates. I will post codes as I get them...enjoy!